Q: I live in the Piney Woods region of northeast Texas (e/of Paris). I have several White-crowned sparrows at the feeder but I just noticed this bird today. I can't find any similar comparison. A: This is a partial albino white-crowned sparrow. There has been discussion in the scientific community as to whether partial "albino" is the correct description. Apparently albinism is a genetic mutation where the body is unable to produce melanin which produces color. Because these birds do have other feathers with normal color, then some say albinism is incorrect. The term leucism has been used to describe birds with muted or faded color and not as deep or brilliant as normal plumage would be, say pastel. 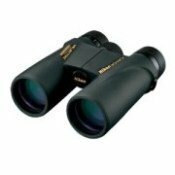 But the discrepancy comes with birds that have white patches and normal colored feathers. Some scientists want to label them leucistic instead of partially albino. You can read more about it here: Albinism vs Leucism in Birds. Q: This bird was at our feeder this week. We live in North Central Maryland. After some research and help from fellow birders I think that it might be partially leucistic Chipping Sparrow. A: Yes, you are correct - it is a partial leucistic or ablino chipping sparrow. Below is some video of another chipping sparrow, but leucistic in another pattern. Regardless of whether it's a partially albino bird or leucistic, one thing for sure is that it's way cool to see! It is rare to see albino birds of any degree so consider yourself lucky. Statistics show that these birds are more susceptible to predators since they stick out among the crowd. It would be interesting to know how long you continue to see this white-crowned sparrow coming to your feeder. Anyway, enjoy while you can! Apparently robins and sparrows seem to have a higher incidence of albinism than other birds. Can anyone ID this bird for me? It was taken last week just outside of Tacoma, WA. It's about the size of a chickadee or junco and I first saw it in early November and then again a couple of times over the last few weeks. 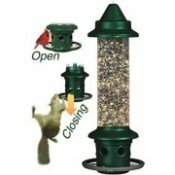 Have tons of birds at my feeders but have never seen one like this. 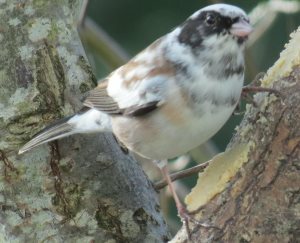 Is it possible that it's some type of albino Oregon Junco? Today Dec 31 saw a leucistic white headed sparrow at feeder. Didn't know they existed. This eve, May 6, a white sparrow came to our feeder. It was pure white on breast and wings with buffy color on top of head and black markings around eyes. Never seen before in 43 years! 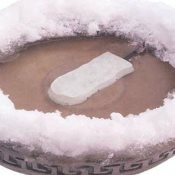 I thought I had gone crazy. 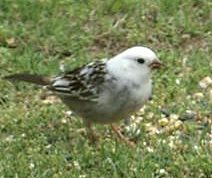 We just saw a "partial albino" sparrow (either a song sparrow or savannah sparrow) and because I am not well-versed in bird watching thought it was a snow bunting or similar (which would be almost impossible in GA) until I saw this post and picture. What a beautiful moment, just sorry I didn't have a camera! 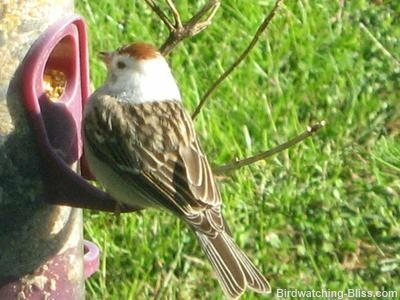 3 days ago we had a leucistic or partial albino chipping sparrow feeding in our yard. He had a pure white head and neck with the rest of his body looking like a normal chipping sparrow. Got some really great pics of him but haven't seen him since.